BRAND NEW. Ranch style home with 4 bedrooms including Master on main level and 3 full baths. Bonus room with full bath upstairs. Wood floors in all main living areas including foyer, dining, hallways,kitchen and family room. Ceramic tile in all baths and laundry room. Large Master bedroom has trey ceiling. Master bath has garden soaking tub, tiled walk in shower, double basin vanity with granite counters and walk in closet. Chefs kitchen includes double wall ovens, D/W, microwave and flat top smooth range. Wood cabinets with granite counters, raised counter bar over looking breakfast area and Family room with wood burning fireplace. Sep. formal dining room for the family feasts. Over sized 3 car garage that can accommodate full size pick ups. Split bedroom plan home with bedrooms 3 & 4 extended 2 additional feet wider. Home sits on a 1.78 acre wooded lot. Daylight basement studded out for easy finishing with 9'ceilings with stairs from inside to access plus exterior access. 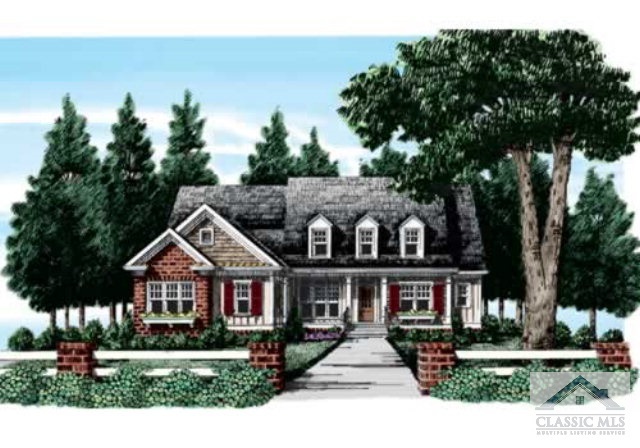 Craftsman style home with ample brick accents across front and water table brick on sides. Walk to the Bear Creek Reservoir across the street from the subdivision for some relaxing fishing. Minutes to all Athens area shopping, hospital and UGA campus. 402 RAPIDS, Bogart GA 30622 is a Home, with 4 bedrooms which is recently sold, it has 2,421 sqft, 1+ - 2 sized lot, and Attached,Garage,Kitchen parking. A comparable Home, has 4 bedrooms and 3 baths, it was built in and is located at 760 Rapids Dr #34A Bogart GA 30622 and for sale by its owner at $ 354,900. This home is located in the city of Bogart , in zip code 30622, this Jackson County Home, it is in the Riverbend At Bear Creek Subdivision, and Bear Creek Plantation are nearby neighborhoods.